his son is also involved in sailing and is looking to gain time at sea towards his captains license. 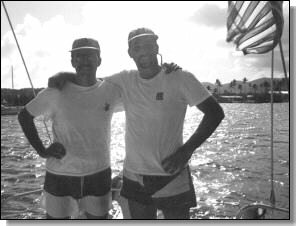 They both are now sailing in the BVI where Aeolian Harp is currently based. Future voyages hope to find Alan and his son cruising through the Panama Canal, up the West coast, up to Canada and then Alaska. Ultimately heading off to the South Pacific. "On our maiden voyage from Clearwater to Key West we either motor-sailed or had 30 knot winds in which we ran a reefed main and genoa--feast or famine for sure. The 36 hour trip was characterized by a series of storms, each and every one different. Each one dramatic in its own right. I had the helm for the first one in 30 knot winds. With full weather gear worn by all four crew (myself, son Greg, daughter Kim and Zolt the hired captain) the Caliber 47 took each of the eight to ten foot waves in stride! Even though the bow would occasionally ship some water, the center cockpit was always surprisingly free from sea water. The boat handled the rough waves and wind conditions uneventfully. Greg was at the helm for the second storm coming four hours after the first. This one hit during the dark of night. The winds were gusting to 35 knots, the seas building ten to twelve feet now. My daughter felt so comfortable that she refused to put on the uncomfortable rain gear, sat right down on the starboard side of the companionway tucked under the dodger, braced her feet against the companionway, and stayed dry and comfortable despite the seas, wind and the driving rain! And to think, this was her first experience at sea and she was handling it like a pro.